Zenefits’ People Platform helps thousands of companies empower their modern workforce. By tightly integrating its own powerful applications with dozens of partner technologies and services, Zenefits delivers the most comprehensive and modern mobile HR experience. With the Zenefits integration, you can create and remove Asana accounts based on HR actions (like hiring and termination) directly within Zenefits. 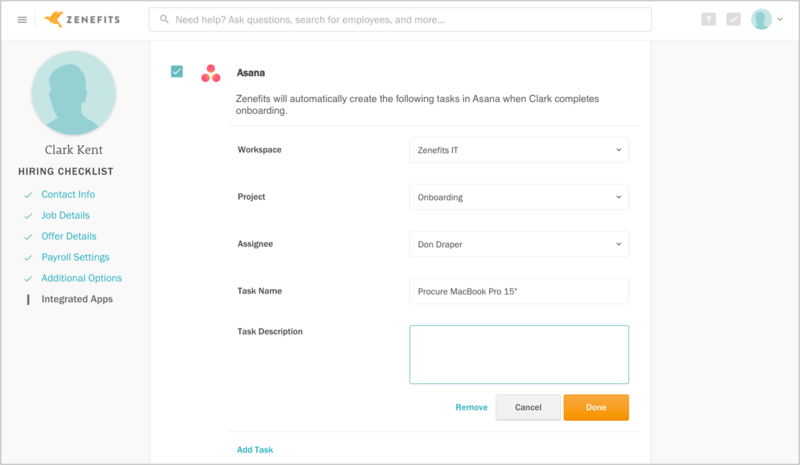 You can also create and assign Asana tasks within common HR flows in Zenefits to streamline your process management. On your main dashboard, scroll down and click on the + button. Choose the Add an App icon. Follow the on-screen instructions to authorize and connect Asana to Zenefits.